“Tell me about your exercise routine” my doctor said a few months ago. This is where she paused. I don’t think that there’s a spot on the healthcare intake form in the system for “livestock lifting” or “murdering chickens”. Just ask my niece and nephew who visited from California last week, and they’ll tell you that a nap is required after mucking stalls, planting corn and catching goats for hoof trimming. 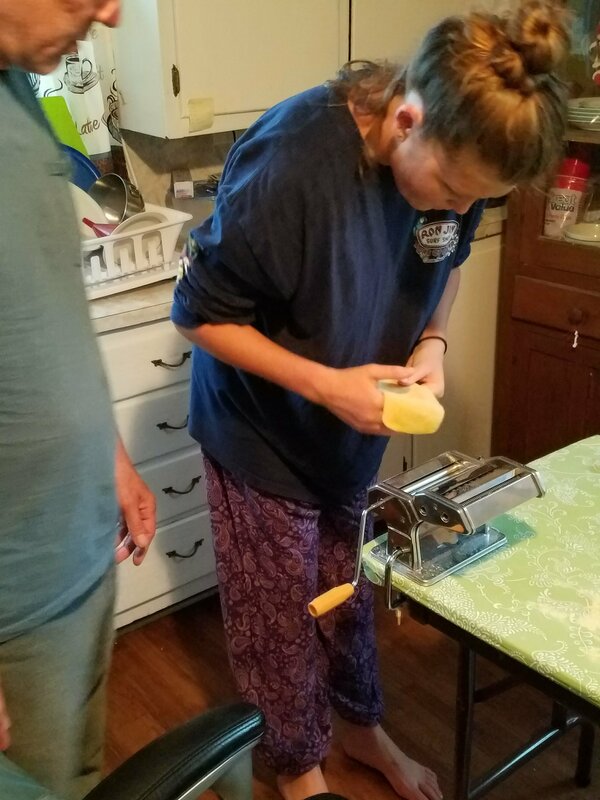 A cousin asked me if they were here on vacation or in need of a place to do community service. I loved having them here. They are funny, bright and growing into wonderful young adults. 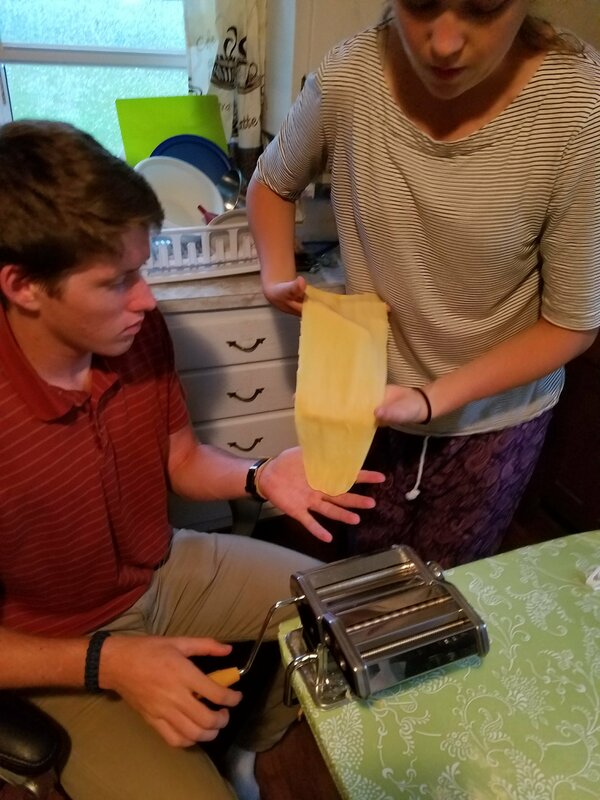 They ate whatever we put in front of them, including the tofu mushroom spaghetti with Jim’s homemade pasta. 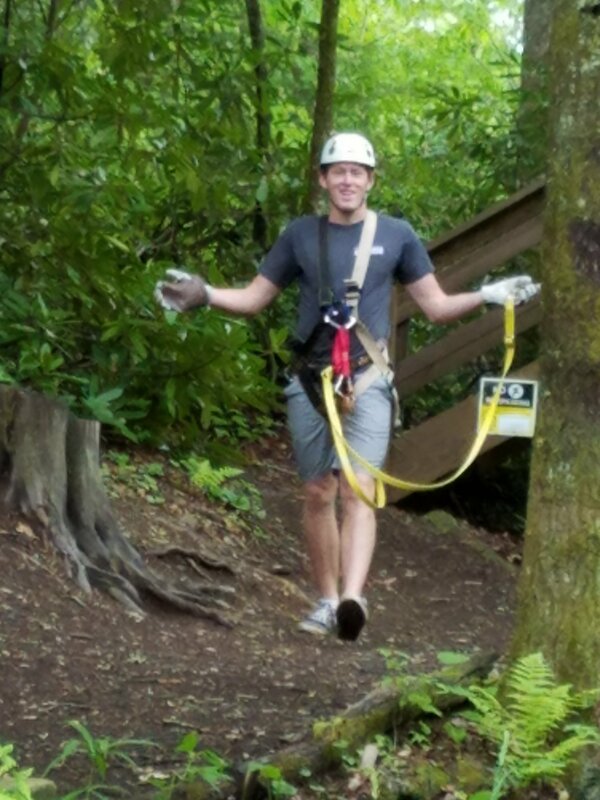 We went ziplining, hiking, visited family they’d never met, sang along to the radio and laughed at jokes that only we thought were funny. 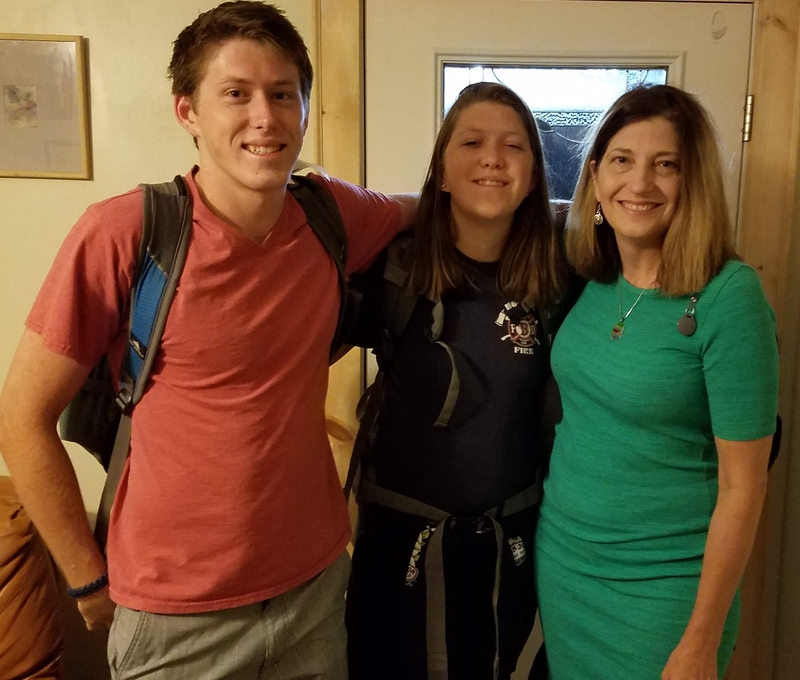 When I dropped them at the airport departures this morning at 6 a.m., I saw a soldier hugging his little girl goodbye as he headed prepared to travel back to a base or his next duty station. Cars jostled for a spot next to the curb to quickly let their passengers out to run for the security line. Amid the noise, I tightly hugged my niece and nephew one last time, fighting back the tears, and I caught a security guard watching me hug these two precious 6-foot tall people that looked like me. I waved goodbye, wished them safe travels, with the words “I love you” lost among the whistles from the guards, the roar of the bus engines, and the smell of exhaust fumes. I realized that this is just another day at the office for the security guard. Like an announcement “we now return to our regularly scheduled program.” With that, I merged into traffic to join the other drivers, knowing that more often than not, our greatest blessings are people we call family. I drove to the office to find myself the first one in my department and a day’s work ahead. By 9 a.m. I was punchy, and my 4 a.m. coffee was gone. One Dr. Pepper and a honey bun kept me going until lunch. Late in the afternoon, I arrived home to take a quick break before heading to the barn to give Bert, Ernie and Steve their CDT shots, and to check the latest challenge of #vittlesvault verses racoon; the raccoons managed to get the lid off again and only ate a handful of cat chow. 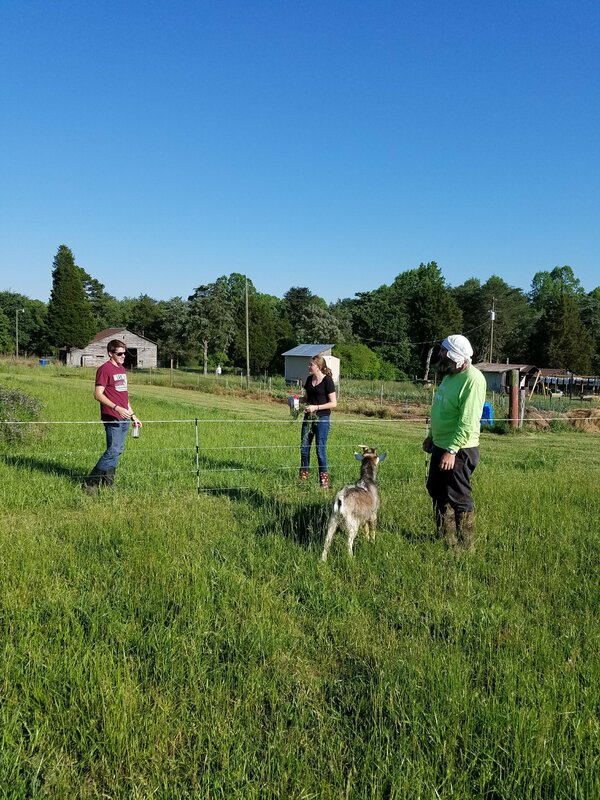 Jim and I took some grain to Bert and Ernie since they are now living in the bachelor pasture with Steve and Sam, separated by two electric fences from the nanny goats. At four months old, Ernie is quite amorous, and we don’t need another round of babies this fall. In the pasture, I knelt to pet Bert and he climbed on my back. 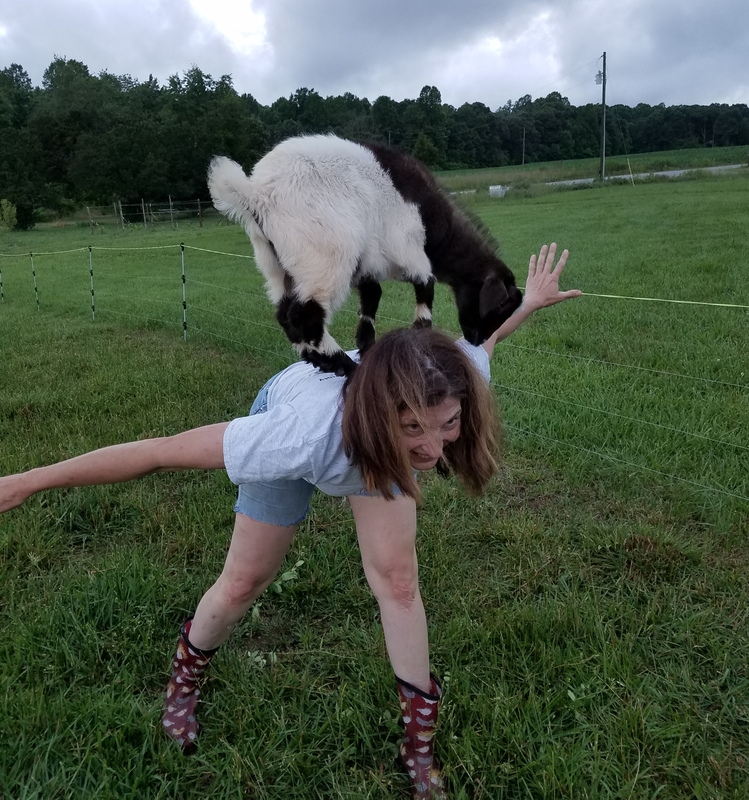 So, this is normal for me: something new and silly with my goats. 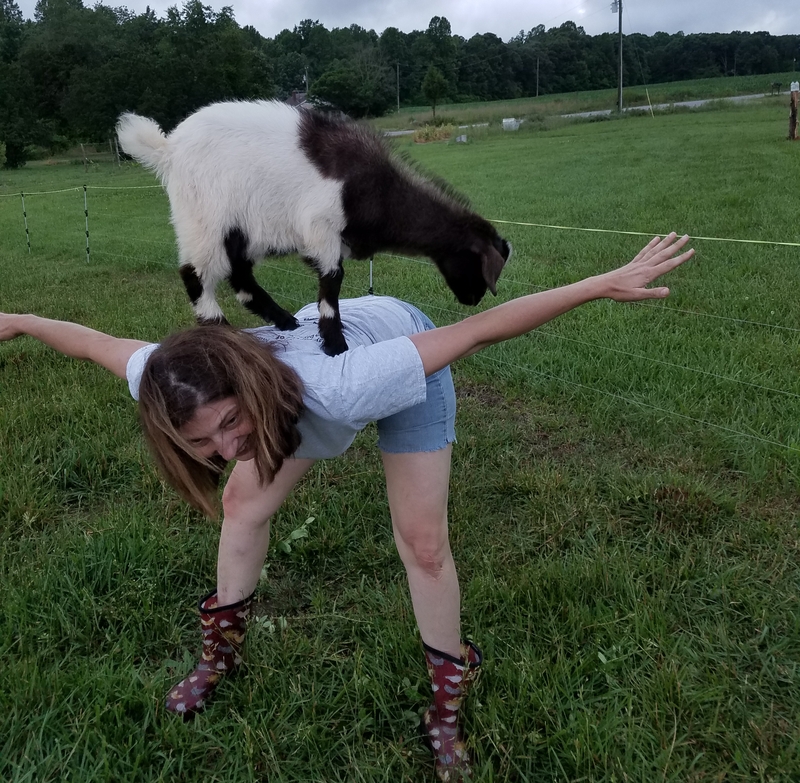 Jim laughed as I demonstrated balancing a goat in two yoga poses. Earlier, when I said that I do goat yoga, I meant that I stand in the pasture and do yoga while the goats and donkeys stare at me. This is a whole new expirament with a little goat who back in February was floppy, unwanted by his mother, had to be tube-fed 4 times per day, and slept in a laundry basket. 1. 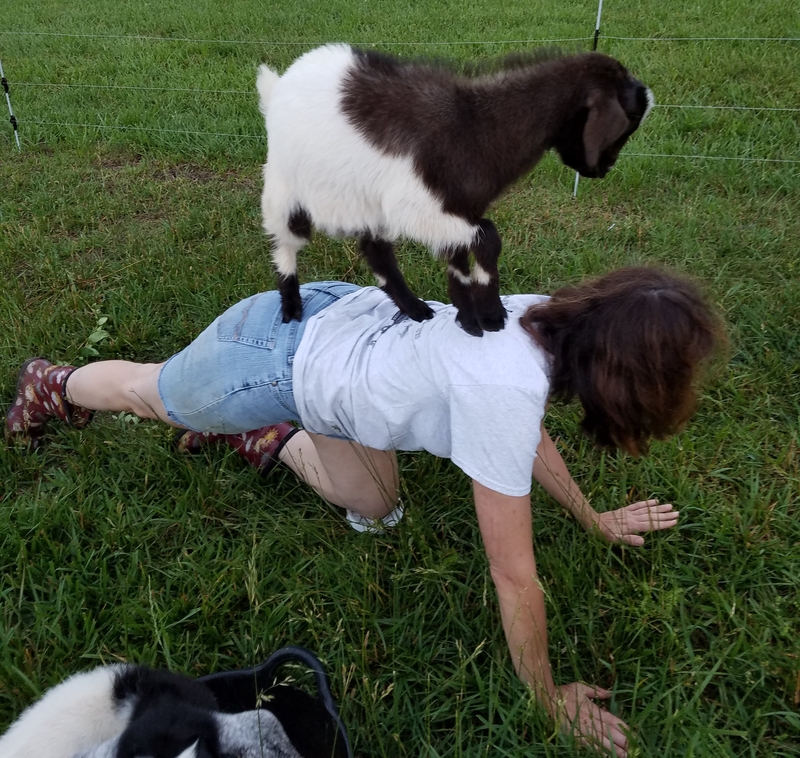 Remember, before starting any new exercise program, consult your doctor…she may not have a box to check “goat yoga with a real goat”. 2. Stretch and be sure that you are comfortable balancing your 20 pound goat. 3. Wear comfortable attire, preferably barn boots and clothes you don’t mind getting dirty. I have one pair of leggings that I wear to give shots. So of you would like to see me do goat-yoga wearing your products, let me know! Note, goats do not take cash for chiropractic, reiki or massage therapies. But the farmer does! Pretty good for only 4 hours of sleep. Love the goat yoga. We live on a farm also. No goats but our kids lol sure wanted some. They’re grown now and we made it without those adorable critters. I’ll watch you have all the fun. Lisa, I’m sure that your kids got into more mischief than my four-legged kids do!